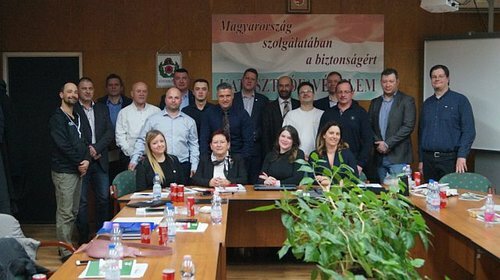 The extraordinary general meeting unanimously adopted the decision that the association will continue its activities under the name Volunteer Research Rescue Team and Firefighter Association with Rescue Dogs of the Hungarian Reformed Church Aid (in short: HRCA-KM). "This moment is a decisive event in the life of the Hungarian Reformed Church Aid, because this will allow us to provide much more assistance in the areas affected by disasters in the future," emphasized István Oláh, Chairman of the Board of Trustees of the HRCA. The tasks and goals of the HRCA-KM include helping people living in the Carpathian Basin, participating in rescue actions with dogs and in research of missing persons, providing primary emergency and health care in disaster areas, engaging in charity activities and acting as voluntary firefighters. To achieve the appropriate competencies, volunteers take part in further training from March, so they can take the necessary examinations by the end of spring. Among the more long term goals, the team needs specialist doctors, in addition to expanding its work with safety advice. Gábor Hegedüs, Chairman of the Orion Association said that it is a great pleasure for them, as well, that a national organization is to join their activities which regularly provides assistance internationally in case of natural and humanitarian disasters with the work of their voluntary medical team.